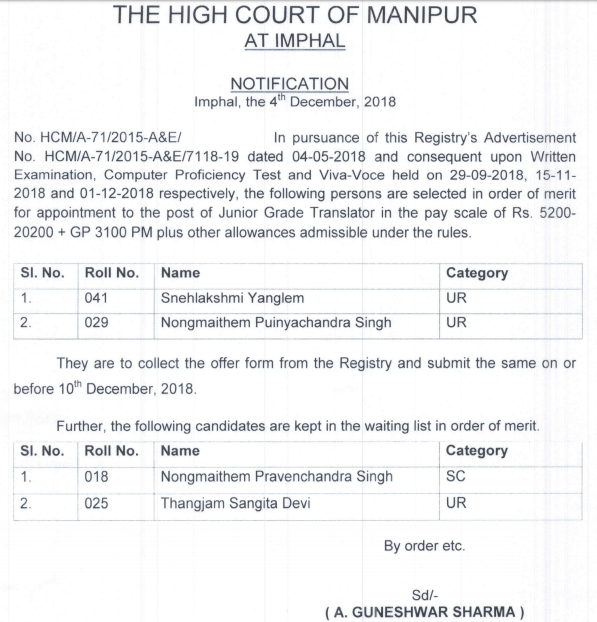 The High Court of Manipur has released the list of selected candidates for appointment to the posts of Junior Grade Translator in the pay scale of Rs. 5200 – 20200 + GP 3100 based on the written examination, computer Proficiency Test and Viva-Voce held on 29/09/2018, 15/11/2018 and 01/12/2018 respectively. The list of selected candidates in order of merit as released by the High Court of Manipur are as follows: Selected candidates has been informed to collect the offer form from the Registry and submit the same on or before 10th Dec 2018. Masters Degree from a recognized University in English with proficiency in any official language of the State.